Sometimes in the dark, short days of winter a good cup of coffee is the only sunshine you get (yes, that sounds cheesy but I've noticed my love of cheesy phrasing seems to increase amidst lacking sunshine). 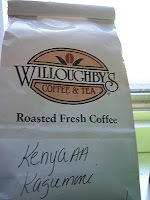 Thankfully, I had a good run with a great pound of Kenya AA Kagumoini sent to me by Willoughby's Coffee & Tea. 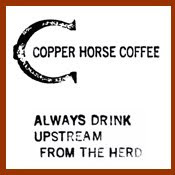 I sampled the coffee in the usual three manors of drip, siphon and french press. French pressing this Kenyan equated to a smooth cup, with sweet peach and apple flavors first, followed with a pleasant nuttiness, wheat grass and some molasses. I found it a beautiful, bright coffee. 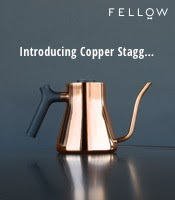 The siphon formed a much sweeter beverage with not as much of the peach/apple sourness, thus the cup had more of the molasses, a good bit of grain, some nutty flavors and still the wheat grass. This particular brew I found to be juicy and smooth. Dripping, the last method produced the molasses with the noticeable brightness offset by a little more darkness and cocoa. The wheat grass still appeared towards the end; an overall good cup though my least favorite of the three samplings (but still a great cup!). My days were literally brighter thanks in part to this coffee (i.e. it was really good). If you are yearning for a good Kenyan, give this one a run. bill, nice to hear you enjoyed the coffee! pleased to hear we brought a little bit of sunshine your way. always looking forward to your next review and interesting find!